Recently I posted a description of my choice of a Pennsylvania Class G22 gondola for an additional “signature” freight car from the Pennsy fleet (it’s at: http://modelingthesp.blogspot.com/2015/09/another-signature-freight-car.html ). As I mentioned in that post, the car should have 70-ton Crown trucks, and I used the Bowser version, their part number 74091. I also mentioned that the kit (Westerfield no. 1201), as built, is rather light, and that weight needs to be added if the car is to be run empty. 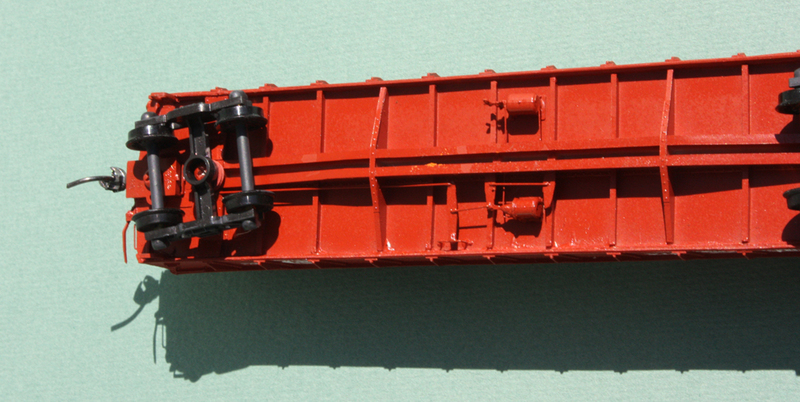 Here is a view of the underside of the assembled model. The brake system is a divided K or KD arrangement. My plan was to fill a lot of the spaces between ribs on the underbody with small squares of lead sheet. A few years ago, Richard Hendrickson and I each bought a sheet of lead from Small Parts Inc., their part no. SPB-062-B, which is a 6 x 12-inch sheet, 0.062 inches thick. 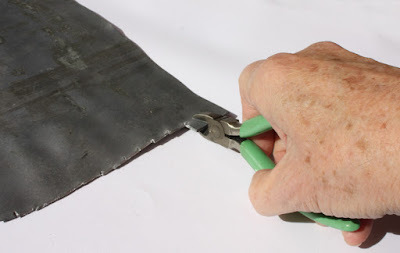 (I also have a sheet of roofer’s lead, but it is thinner, so not as convenient for this application.) The material is quite soft and easily bent or straightened, and easily cut with side cutters. I simply started cutting rough rectangles of the size of the spaces between the ribs on the G22 model, as you see in this photo. (You can click on the photo to enlarge it if you wish.) As will be obvious in a moment, exact size and shape were not goals in cutting these. If you're interested in this material, you can visit www.smallpartsinc.com . With all the non-brake-gear slots filled, it looked like the photo below, and weighed 2.7 ounces. That means I have added well over 2 ounces to the car. This is still light by NMRA standards, but in my experience will be all right at this weight. I rarely weight my cars to the full NMRA value; for example, a 40-foot car should weigh 4 ounces according to the NMRA, but I usually am nearer to 3 ounces on such a car. As many others have noted, consistent weight is more important than any particular amount of standard weight. I have discussed this point myself in prior posts (such as this one: http://modelingthesp.blogspot.com/2012/02/open-car-loads-bulk-materials.html ). The weights (you can see I did not particularly try to cut exact sizes and shapes) were cemented in place with canopy glue, and will all be painted flat black before the car goes into service, though the height of each lead piece is less than the depth of the side sill, so that from a level side view, they are all invisible. A word about the lead material. You can find some hysterical commentary on the Internet about lead, but in fact, it is not a dangerous material at all, if handled with recognition of what danger it does pose. You don’t want to ingest lead oxide, which is what is on the surface of the lead sheet, so keep your hands away from your mouth or any food or drink while working, and do wash your hands as soon as you're done working with the lead. And that’s it. No other problems to worry about. With the car sides weathered, and the reweigh and repack decals added, the car looked like this. The interior is not weathered yet, but that is a fairly straightforward process and doesn’t have to be part of this post. I’m happy to have this additional PRR freight car added to my fleet, as it is certainly among the many Pennsy cars which can qualify as a signature car. Some years ago, when my layout and I were still living in Pittsburgh, PA, I envisioned an industry on the layout which would manufacture and ship both water pumps and air compressors, and I chose the name “Jupiter” for it. The name, of course, was chosen to denote big, powerful products. I did have a spur designated as Jupiter on my then-layout town of Los Olivos, and some switching of cars to and from that spur was done. But no structure was ever built to represent the Jupiter plant. 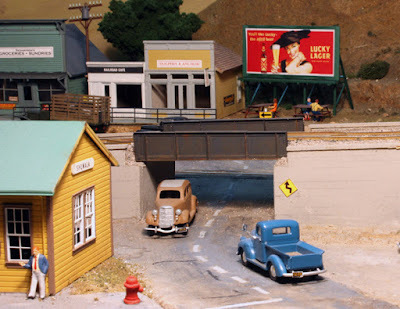 With my new layout in Berkeley, there was no space for the Los Olivos part of the old layout, so some new location had to be envisioned if there was still to be a Jupiter company. That was about as far as thinking had progressed, until the beginning of Santa Rosalia tracklaying (see my description at this link: http://modelingthesp.blogspot.com/2015/05/flash-tracklayers-enter-santa-rosalia.html ), when I could finally recognize a space that could be usable for Jupiter. My ideas were that Jupiter had its own foundry for cast iron parts, and would also fabricate parts from sheet steel and rod, then ship a wide variety of pumps and compressors for mining, farming, shipbuilding, and other uses, meant that there could be a substantial variety of loads inbound, and plenty of loads outbound. This would nicely balance all the agricultural shipping already in place in Ballard. 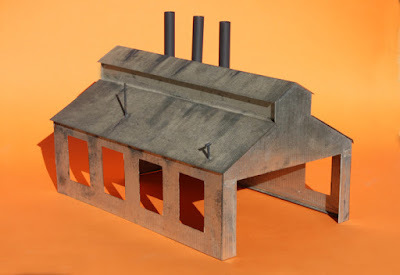 My starting point was a very old kit structure, a Suydam corrugated metal Pacific Foundry (kit 19) I had assembled when I was in high school, using one of those massive copper-block-tip soldering irons heated in a gas flame (in the school metal shop). Partly because it is all galvanized metal and real durable, it has survived pretty much unscathed, all the intervening years. (Incidentally, I note there are plenty of these kits available nowadays on eBay.) Windows never got installed. The building needs a dirtier roof and some indications of rusting corrugated sheathing, all of which I will add with my usual acrylic washes. For more on them, see the Reference Pages at the top right of this post. I envisioned this structure as a receiving facility for the Jupiter plant, so cars could be spotted inside the building. The doorways are not tall enough to permit that, so the structure needs to be raised by placing it on a foundation. First step was to lay an entry siding off of my track between Ballard and Santa Rosalia. The area is shown below (the structure with a green roof is a space-holder). The rectangular space at left rear is to be the site of the Suydam mill building shown above. In the foreground is the main line between Ballard and Santa Rosalia, and the switch which doesn’t connect to anything will be the lead to Ballard’s Track 7, the rear industry lead. In the photo above, some bare plywood can be seen. This is the last such area on the entire layout, and for track support, I chose to use sheet cork. A piece was cut and fitted to the plywood area you see above. 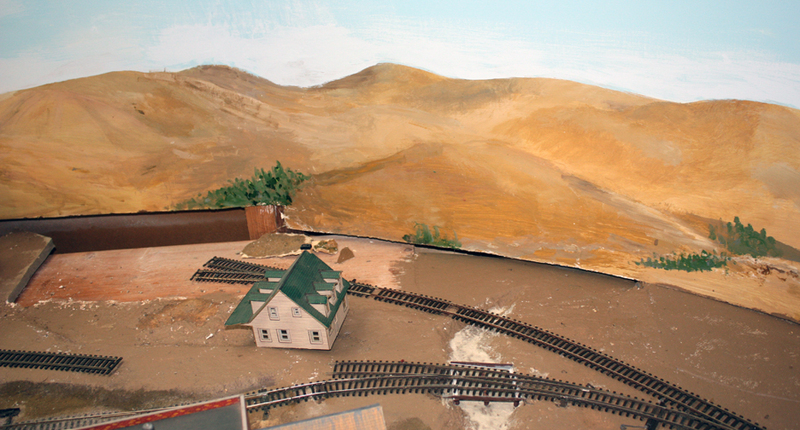 To the left of the area shown above, there is a substantial gap between the layout surface and the bottom of the backdrop. The next photo shows more clearly how this looks, with the Suydam building (now weathered) in place to indicate where it will be located. At the left edge of the photo above, you can see that part of the gap has been covered. I have used a method of “closing” such gaps, without rigidly attaching the backdrop and layout surface together, with a folded strip of manila folder stock. 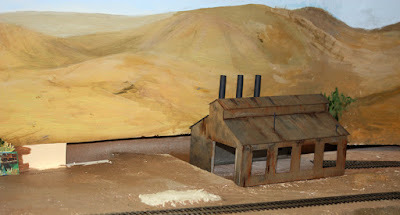 (See my post at: http://modelingthesp.blogspot.com/2013/12/joining-layout-and-backdrop.html ). My next step, then, was to use that method in this location. When glued down (only the horizontal part is glued), the manila looked like this. Alongside the new manila space-filler, you see a building flat. This is a part of a KingMill Enterprises product, included in their “Radical Flats” Commerce St. series, sheet no. 9. The part that you see in the photo above is what was left over after I cut out part of this KingMill sheet to make my Caslon Printing Co. flat, which I described in a previous post (see it at: http://modelingthesp.blogspot.com/2013/02/background-flats-2-kitbashing.html ); there you can see most of the full Commerce St. no. 9 sheet before cutting. The KingMill website ( http://www.kingmill.com/ ) reports that they no longer sell these products, but it is rumored that the line has been sold to Scenic Express, so these fine backdrops may become available again. The site for Jupiter is coming along nicely. Given the wide range of both inbound and outbound traffic associated with this business, I look forward to its contribution to operating sessions! In the period since Richard Hendrickson passed away last summer, I have posted a few descriptions of some of his interesting open-car loads. One of these posts was about the several multi-car loads he had built (you can see it at this link: http://modelingthesp.blogspot.com/2015/03/richard-hendricksons-multi-car-loads.html ). Another post showed four different lumber loads he had built (and one load of creosoted poles); that one can be found at: http://modelingthesp.blogspot.com/2015/06/richard-hendricksons-lumber-loads.html . All those loads, and the ones in this post also, were ones Richard carefully built after study of the AAR loading diagrams for each type of load. In the present post, I want to show a few more of his loads in open-top cars. I will begin with a recent example, one I know he completed just two years ago, which is a Proto2000 Illinois Terminal flat car (no. 1133) with a load of Army trucks, perhaps surplus ones, as they carry no lettering or emblems. Like the other photos in this post, this image is among the photographs I took of nearly every freight car in Richard’s fleet, though quite a few, more than 75 cars, have now gone to a variety of new owners. A relatively simple load, but an effective and realistic one, is pipe, whatever the diameter. Richard completed three gondolas with essentially identical pipe loads. to model something often seen in prototype photos: a cut of cars all going the same place with the same loads. Here is one of them. Another classic load, though not often modeled well, is auto frames, from the days before “unibody” car construction. Based on a prototype photo, here is a correctly loaded car of frames, with racks modeled from the prototype photo, shown in Pere Marquette no. 10209. A Tichy flat car was modified for this next load, a pressure vessel of some kind, marked for its builder, on Texas & Pacific flat car 5048. It is tied down with cables to the stake pockets. In a number of his models, Richard “kit mingled” as well as changed and replaced kit parts, so I can’t always tell the entire origin, but I do recognize a few cars which he built pretty much straight from kits. One of my all-time favorites among his freight cars is this load of crates, all correctly tied down to the car, all marked with red “up” arrows and stenciled with destination labels for each crate, on NYC 499372. The tie-downs are chart tape, representing steel banding, run through the stake pockets and doubled back to be fastened above the pocket. The purpose in showing these is not only to illustrate some of Richard’s accomplishments, but also to provide, possibly, some inspiration to other modelers as to the scope of loads that can be built, and ways to tie them down to the car. We all know perfectly well that agriculture is seasonal, with any number of familiar items of produce being available only in certain parts of the year. This of course reflects when each particular crop is harvested (though some, like apples, are disbursed from storage outside of harvest season). The seasonality of harvest in turn affects rail shipment of produce (for those modeling such shipment). But is this seasonality often modeled? I would say “not often,” though of course those who model a particular date, or a month (as Richard Hendrickson did in choosing October 1947) do keep repeating the exact same season every time they operate. With respect to agriculture, it’s kind of the modeling implementation of the Groundhog Day movie. One thing I thought would be interesting to model on my layout is the changing harvest seasons in California, where a truly broad range of crops is grown. How would you go about learning the necessary information to model those seasons? There are extensive U.S. Dept. of Agriculture (USDA) reports, both descriptive and statistical, for most areas of the country and spanning many years. But for my layout, Southern Pacific territory harvests are described, by growing area, in a six-page table in the back of the PFE book (Pacific Fruit Express, 2nd edition, A.W. Thompson, R.J. Church, and B.H. Jones, Signature Press, Berkeley and Wilton, CA, 2000). It lists 43 different crops, from anise to watermelons, and gives both the main harvest season (black bars in the chart below) and lesser harvest seasons (gray bars). I selected out the vegetable crops I know were and are produced in the general area I model, called the Guadalupe-Santa Maria District (mostly the Santa Maria Plain on both sides of the Santa Maria River). I have just used the table entry lines for that district. You can click to enlarge. 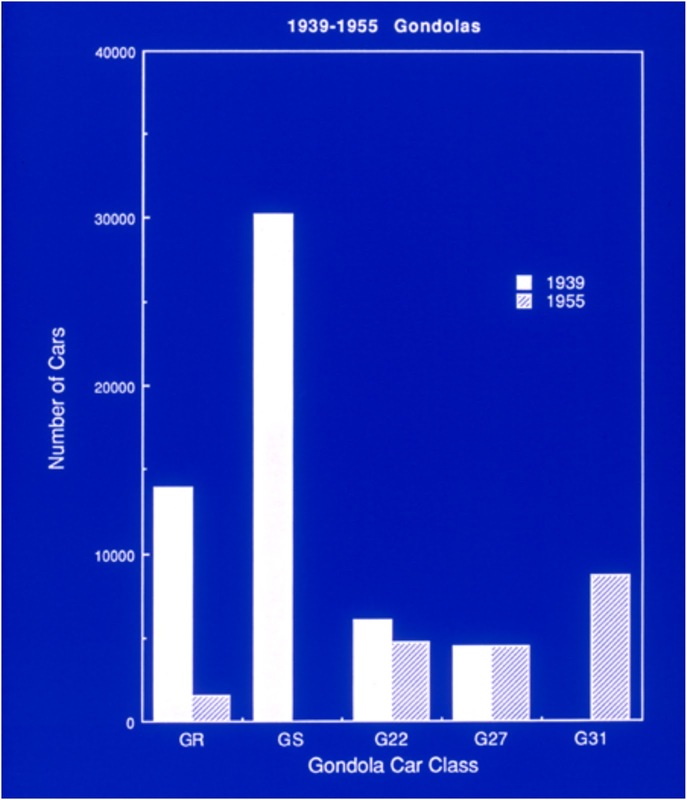 These data are from the 1940s. I have been warned by those who know farming, that these data will inevitably vary over time, as new varieties of each crop are introduced, often chosen to ripen at less competitive times of year for that crop, and older varieties may cease to be planted. But these data certainly give me a starting point. In a previous post, I gave a general introduction to this topic and to use of these harvest season tables, and to the topic of pre-cooling produce. 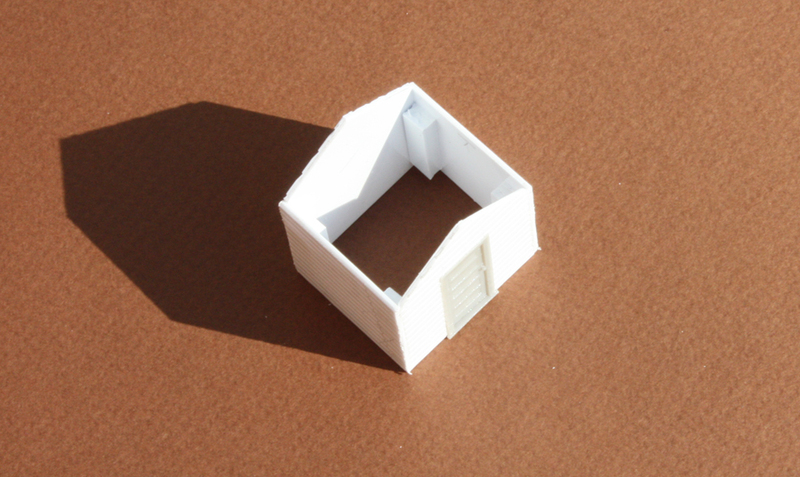 You can read it at: http://modelingthesp.blogspot.com/2011/08/few-words-on-packing-houses-and-produce.html . Perhaps the most striking thing about the table shown above is that there is something being harvested in this district in every month of the year, and in each month there is at least one peak harvest period in progress. And one crop I know was and is significant in the district, carrots, is not even shown. Carrot season in this district is all but year-round, so it can be added to the eight crops listed in the table above. I have two vegetable packing houses on my layout, Phelan & Taylor in Shumala and Western Packing in Ballard, so both can reflect the seasonality you see above. I have created waybills to mirror that (more about them in a moment). Although these fruit crops are not shown for the Guadalupe-Santa Maria District in the 1940s SP tables in the PFE book, I have another crop summary for this area, which permits me to construct something like the above table, for the fruit grown in this area, mostly on Nipomo Mesa. The grape season shown is for wine grapes, not table grapes. I have also included some citrus at the bottom of the table. This is a small exaggeration in the case of lemons, as the area I modeled is some miles north of actual lemon territory. Navel oranges, on the other hand, were in fact raised on the Nipomo Mesa, though barely in commercial quantity, so I can include an occasional orange carload too, in the span of December to March. 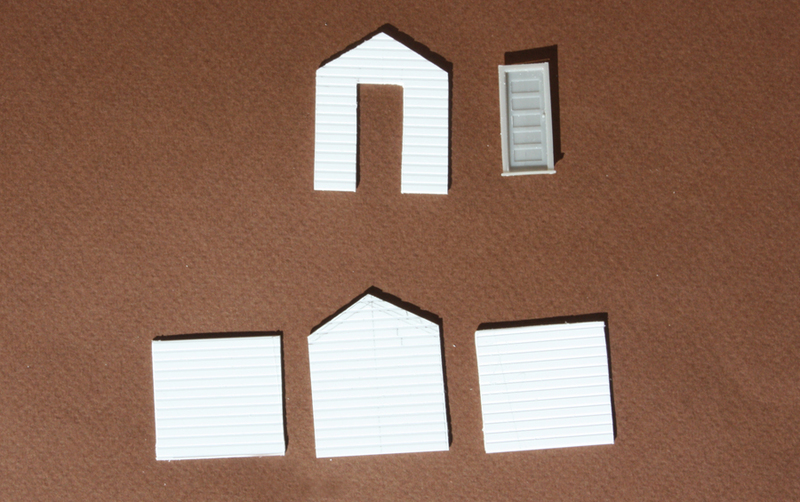 My core idea for layout operations is that the packing house shipments reflect the current actual season. That is, the day and month on the layout are those of the current calendar, though the year is always 1953. Right now, since it’s September, the shipments on my layout reflect what you see in the tables above for September: primarily celery, lettuce and tomatoes, with a few carloads of broccoli and carrots. For fruit shipments, there is really only wine grapes and lemons at this time. 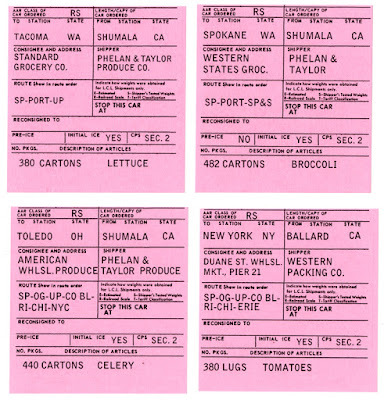 Over time, I have created Southern Pacific outbound waybills for all non-meat refrigerator cars in my fleet, because all might be used on occasion for perishables shipped from my packing houses. Thus I can add variety with “overlay” or stub waybills, for different destinations and different cargoes. (The design and use of these overlay bills was described in an earlier post, which is at this link: http://modelingthesp.blogspot.com/2015/06/waybills-part-41-overlay-bills.html .) 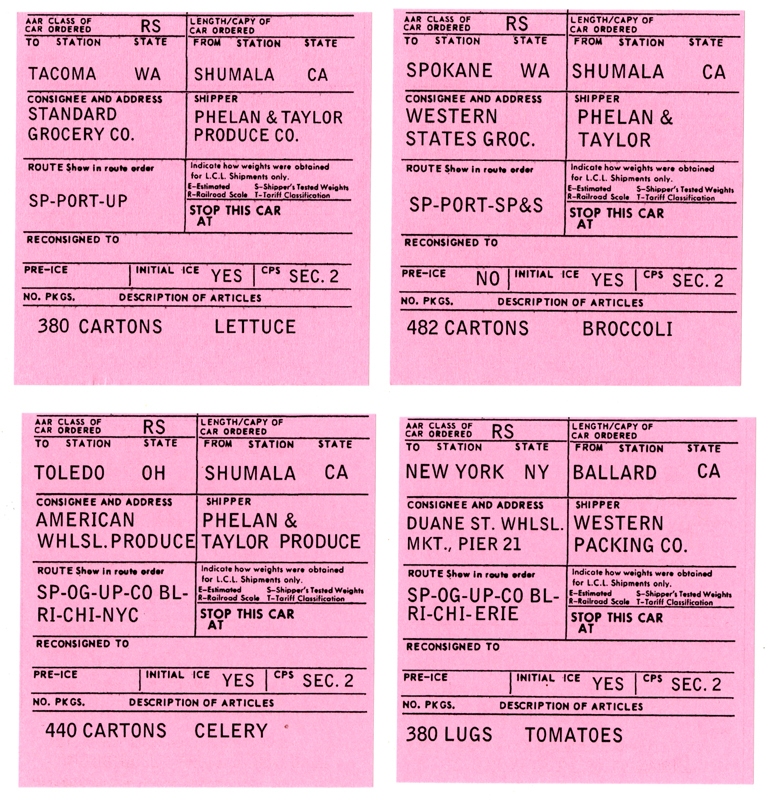 Here are four of my overlay bills, suitable for September vegetable shipping. 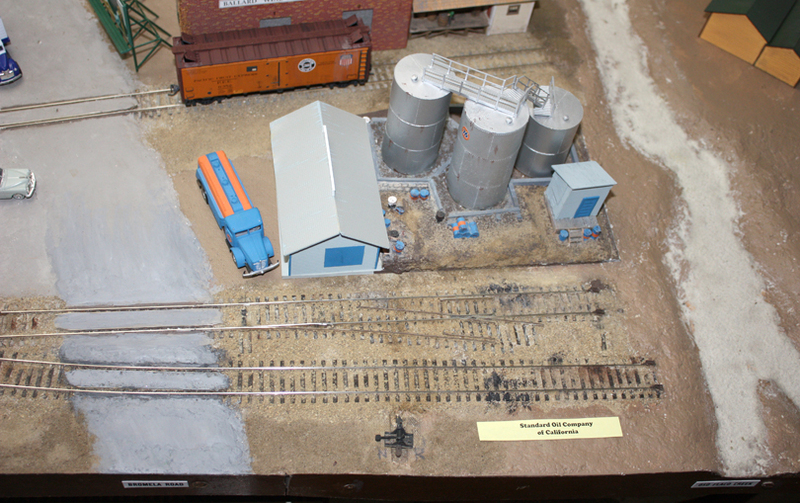 The description in this post outlines the general approach I have taken to reflect seasonality of crops in my modeled area, through the rail shipments that result. Obviously this approach could readily be adopted to any area of the country, though in most other areas there would probably be a smaller variety of crops being grown . 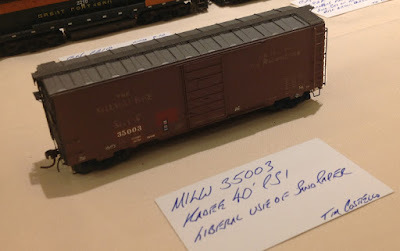 I wrote a two-part series on “signature freight cars” in my “Getting Real” columns in Model Railroad Hobbyist, and these appeared in the issues for April, 2013 and March, 2015. As with all issues of MRH, you can download these for free from their website, www.mrhmag.com . I’ll repeat my definition of a “signature” freight car from those articles. The term is sometimes used for unique cars of a particular railroad, such as the famous Milwaukee Road rib-side box cars that I described in the first column, but to me the meaning is broader than that. 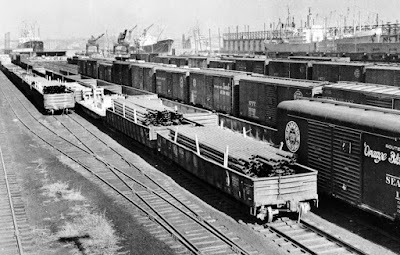 I use the term “signature” to mean a freight car which is characteristic of its owning railroad, meaning that it is reasonably distinctive, and also that it is a car of which the owner’s roster contained a relatively large number of cars. Unique cars can certainly qualify, but there are many cases where a “standard” car design also qualifies, just because its owner had so very many of them. There are examples in both of my articles, among the 19 railroads for which I designated “signature” cars. In those articles, I deliberately restricted myself to only three car classes for each of the five biggest railroads, to two cars each for the next twelve railroads, and just one each for the two smallest roads chosen. But for truly large railroads like the Pennsylvania and New York Central, this really is an underestimate of the impact of those large fleets. In my own layout freight car roster, I not only have four PRR X29 box cars, and four of the NYC USRA-derived steel box cars (only one of each of those types was shown in my second column), but I also need even more cars to represent these big roads. An important car I wanted to add for PRR was the G22 gondola. A relatively early steel gondola, its 46-foot inside length made it distinctive when the first 4000 cars of this class were built in 1915. Originally the cars had four drop doors, but these had been removed from all cars by about 1940. The original cars had fixed ends, though many cars received drop ends instead, making them Class G22a. Some cars were converted for container service, usually making them Class G22b. Original brakes were Pennsy’s preferred “divided K” system, called KD, but these brakes were replaced on many cars with AB brakes in the 1940s. All number groups within the 800,000 series are smaller than these. You can see above that the GR and GS classes were dominant in 1939, though they were already beginning to be scrapped in large numbers. By 1955, G22 had become a relatively large part of the PRR gondola fleet (second only to Class G31 in all its subclasses, which was the class chosen in my second MRH column). Below is a prototype G22 photo. It was taken by Paul Dunn at Zanesville, Ohio, and is from the Richard Hendrickson collection. There are fine Westerfield kits for G22 and both subclasses, G22a and G22b.I decided to do a G22 car, as they were very numerous, and had Dennis Williams assemble my kit as part of a batch of other work he was doing for me. As always, I prefer to do my own decal lettering and then weathering. Here is the model in fresh paint and lettering, and with interim trucks (I will apply 70-ton Crown trucks later). Weathering will of course be added, and then fresh paint patches for reweigh and repack stencils. The car is also very light, and weight needs to be added if the car is to be operated empty. There are a couple of ways to do so, and I will cover that in a future post. These cars were used for the usual wide variety of loads carried in gondolas. Back in January 2012 I showed a nice B&O photo of a PRR G22 loaded with pipe, at the Locust Point yard [Baltimore] — see it at: http://modelingthesp.blogspot.com/2012/01/open-car-loads-pipe-in-gondolas.html . Here is a repeat of that photo. Pipe loads like this are easy to make with coffee stirrers, as I showed in the same earlier post, at the link shown just above the photo. One way to add weight is to build the coffee-stirrer load on top of a piece of lead or sheet steel, but that begs the question of running empty. I am glad to be adding this car, representing a significant gondola among the largest freight car fleet in North America, the Pennsylvania Railroad, to my operating fleet. Partly on account of hosting some operating sessions on my layout, and thereby needing to convey to visitors the locale, era and concept of the layout, I’ve been thinking further about the age-old issue in this hobby (and other hobbies): how far do you go in your efforts to realize your vision? This is not a new thought process for me, and I still vividly remember from years ago an excellent “Trains of Thought” column by Tony Koester on this very subject. So warmly did I remember the impact it had on me that I looked it up and re-read it (it was in Model Railroader, December 1995, page 150). And sure enough, it resonates with my own thinking even now. At the time, Tony still was progressing with his layout as the Allegheny Midland, but was already thinking about what he would do if he were to start over — and sure enough, it was the Nickel Plate around Frankfort, Indiana that he chose to think about even then. Now, of course, the exact idea he then described of a Nickel Plate layout is up, running and still growing. My own ideas are considerably different, in geographic style and space if nothing else. But there is a common thread. I’ve already made, and continue to make, a series of decisions reflecting how far I want to go, or feel it’s realistic to go, on each aspect of my layout. My chosen locale is the Central Coast of California, between San Luis Obispo and Santa Barbara, the Guadalupe Subdivision of Southern Pacific’s Coast Division. I am not entirely sure of the reasons for the choice, except that other locale choices did not appeal as much. The chosen area is moderately rural and has mostly fairly small towns, good for modeling, yet the main track of the SP Coast Line runs through it, ensuring that I can have as much SP character and action as I want to create. But I have not chosen to model specific towns or specific buildings along the right of way, nor is my layout backdrop even quite correct for the actual skyline of the modeled area. I guess I could say that my goal is to represent the area, not the exact features in the area, and to try and model general features of the railroading in the area, without being too concerned about exact procedures. But it’s always interesting to find out from people who worked in the area, how things were done. 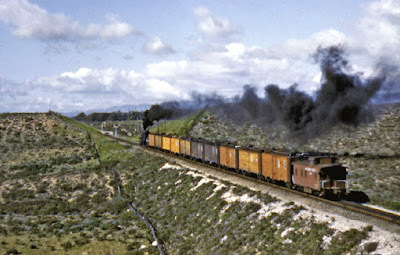 This is evidently a local freight train, photographed at Hadley just south (railroad east) of San Luis Obispo. Mac Gaddis was one of those who told me it was the Guadalupe Local, and was running backwards because locomotives couldn’t turn at Guadalupe, thus had to run tender-first in one direction or the other. The crew could choose which direction they would run that way, and for the afternoon departure, as you see above, they ordinarily chose tender-first outbound, since they would be coming back after dark, and a certain number of motorists might be on the way home from taverns, and you wanted to be running locomotive-first if encountering at a crossing one of them who happened to have impaired judgement. That of course means that photos of the Guadalupe Local returning to San Luis Obispo should show the engine leading, as indeed they do. (Though the photo below, near Bromela Road by Dallas Gilbertson, March 1954, shows the Local returning in daylight). Incidentally, this photo was published with a caption stating that these reefers with hatches latched open were empties, while in fact they were certainly loads of winter vegetables (likely broccoli and cauliflower), in ventilator service, coming from Guadalupe packing houses or the Santa Maria Valley Railroad. I find these little details interesting because all the traffic pickups and set-outs for my layout branch line take place at the main line junction, and are done by the Guadalupe Local. But I have not tried to duplicate exact procedures followed by this local train. I had long wanted to model the transition era, but didn’t choose a specific year until I researched SP locomotive history and found that 1953 was the last year when steam was a major part of the motive power on the Coast Division. That was the environment that I wanted. And there is ample documentation of what engines in steam were assigned on the Coast in that era (along with equally good documentation of where new diesel power was assigned). The SP modeler has been well served by the importers of brass locomotives ever since such importation began, so it was a matter of choosing which ones I wished to operate. I have rarely taken the trouble, however, to modify a brass steam locomotive to exactly duplicate the appliance arrangement and other details of the engine number I modeled (nor have I made sure that every one of my diesel locomotives exactly matches the prototype of the engine number I used). 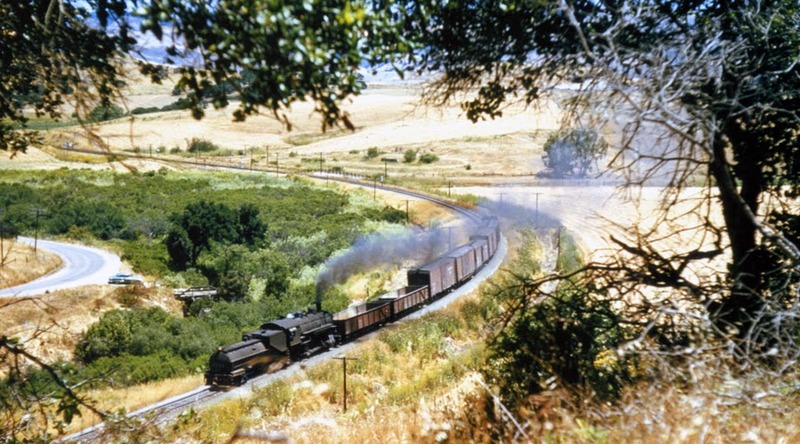 Here’s a steam example, Consolidation 2829, assigned to San Luis Obispo for years, with its distinctive rectangular tender (good rearward visibility for switching). This Alden Armstrong photo dates from 1954. My Key brass Consolidation 2829 is a mainstay of the present layout; its rectangular tender was borrowed from a Max Gray SP Twelve-wheeler, which captures the main look, without a lot of worry about lesser details. My model shows up in lots of layout photos. For example, see this post: http://modelingthesp.blogspot.com/2012/03/open-car-loads-lumber-in-gondolas.html to see the tender, or this one for a glimpse of the locomotive: http://modelingthesp.blogspot.com/2013/06/pfes-western-pacific-cars.html . But those locomotive matters aside, I do find myself quite careful to be accurate about the 1953 modeling year. I have often researched topics like period advertising, so my billboard ads are suitable for 1953, and likewise for freight car paint schemes and degree of weathering, models of automobiles and trucks, and a variety of operational details, even to the specific SP paperwork in use at that time. But I can’t be sure every scale figure has 1953 clothing, nor that every automobile has the right color for its model year. Again, I want to convey the feel of 1953, as accurately as I can, without necessarily being perfect in every detail. 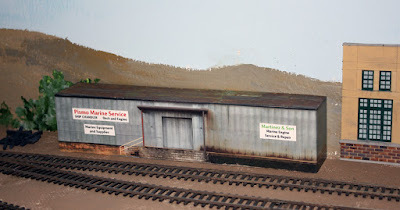 I have a considerable interest in freight cars, and enjoy building or modifying models. But here again, one has to draw some lines. One old saw in freight car detailing is the question whether your brake pipes are actually tubular. After all, the prototype is that way. Further, Jack Spencer among others has done a superb job of modeling the angles, tees, and unions of underbody piping, though I haven’t chosen to do that (beyond a contest model of some years ago). One could also raise the possibility of modeling working brake gear. This has certainly been done in O scale, but even there, this is pretty challenging because friction has to be minimized very strictly. I know it’s possible in HO, and has been done, no doubt after a heroic amount of effort, but I am definitely not going there. There are those who use individual boards for wood sheathing on house cars, or who move or add rivets (or bolt heads) throughout the car body, to duplicate the prototype locations. Again, I would rarely do that except for rows of rivets. So there are certainly lines in my freight car modeling that I choose not to cross. The topics I’ve been describing are among the innumerable compromises that any modeler makes, for a wide range of reasons, and most involve drawing some kind of a line, at some kind of personal limiting factor. These are some of the places I have drawn mine. I have shown in a number of recent posts my models of oil dealerships for the Associated Oil Company and for Union Oil Company of California, and the core of the Associated project made up my “Getting Real” column in the Model Railroad Hobbyist issue for March 2014 (you can download this or any issue of MRH, any time, for free, at their web site: www.mrhmag.com ). But I also wanted to add another bulk oil dealer to my town of Ballard (two or more oil dealerships in small town was very common). In fact, my two dealerships would be reached on adjacent spurs. The problem, and the opportunity, was that there was really no room for another industry at the desired location. The opportunity part is that the industry doesn’t actually have to be modeled, just the unloading spur and equipment. Shown below is the site, on the side of the trackage toward the bottom of the photo, and you can see how little space was actually there, certainly too little to include any storage tanks or warehouse. You can see a narrow strip of yellow paper on the site, which has informed crews that the location is a Standard Oil Company of California facility. 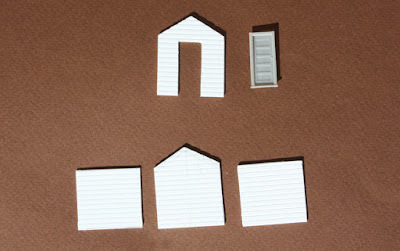 Next, of course, the walls were assembled into a box, with styrene strip in the inside corners, and the door installed. Trim strips on building corners remain to be added. I added corner trim strips of scale 1 x 8-inch styrene, painted the building with Testor’s medium gray, made a simple corrugated roof, and painted the roof with Tamiya “Gunship Grey.” To the most visible side of the pump house, I added the Standard emblem used by Standard Oil of California all through the 1950s (readily found on the Internet). As suggested above, I also built duckboards, and added some intake piping with leftover plumbing from the McGraw Oil kit which was the foundation for my Associated Oil Company dealership, then made lengths of hose from No. 22 wire with black insulation. This is all shown below. Each of the two intake pipes is supported by a block of styrene, painted Concrete, and bronze fittings are suggested with gold paint. Some lines of military modeling colors do have a Bronze paint, but I have not picked any up yet (I can always repaint these details). All assembled and in place on the layout, this nearly virtual dealership model looks like the photo below. I have two duckboards, each with an inlet pipe, and more details need to be added, probably a pipe storage rack in the right foreground. But this certainly works as a switching destination. 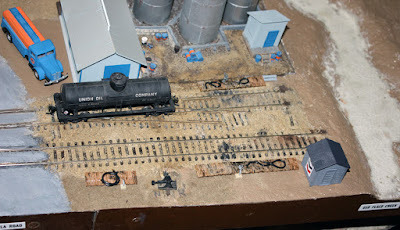 I might mention that this Standard Oil model was included in the clinic I presented at the Portland NMRA national convention (August 2015), and the handout for that clinic is available as an earlier post in this blog (you can view it at: http://modelingthesp.blogspot.com/2015/08/handout-for-oil-dealership-clinic.html ). As is evident, all I have actually modeled of this particular dealership is the siding and the unloading capability. I included a pump house mostly so I can put up a Standard sign to identify the industry. Works for me. My latest “Getting Real” column appears in the September issue of Model Railroad Hobbyist. (Probably it’s well-known, but anyone can download any issue of MRH for free, at their site, which is www.mrhmag.com ) For this column, I chose to revisit in more detail a couple of topics I have discussed in earlier posts on this blog: billboards and vehicle license plates, from the point of view that both are important aids in setting the era of your layout. This is in response to the overall goals of the “Getting Real” series, to present ideas and suggestions about approaches to more prototypical modeling. The second part of my column was about automobile and truck license plates, again as I have discussed in briefer fashion on this blog. Some of the places I have touched on modeling license plates are my introductory post (at: http://modelingthesp.blogspot.com/2011/04/choosing-and-modeling-era.html ), and then following that, more than a year later, a couple of posts that went into much more detail, first about automobile plates (see it at: http://modelingthesp.blogspot.com/2012/11/vehicle-license-plates-in-ho-scale.html ), and then a separate discussion of truck license plates, then and now differently arranged in California compared to passenger cars, at: http://modelingthesp.blogspot.com/2012/12/vehicle-license-plates-trucks.html . I only mention these earlier posts for those who may be interested in additional information. Here is a photo I took just for the column, showing a pickup truck plate, and incidentally in the background, another interchangeable billboard. The photo is obviously taken at about the same location in my layout town of Shumala as the photo above, though showing slightly different parts of Chamisal Road as it ducks under the track of the Santa Rosalia Branch above. Having covered these subjects together, as era-setting aids, and also going into more detail on the billboard side of the topic, I felt the column served some purpose, and have alrady received positive feedback about it, which after all is as much as you can hope for. In Part 1 of this thread, which is at: http://modelingthesp.blogspot.com/2015/08/a-union-oil-company-bulk-dealer.html , I showed the basic changes made to a Chooch resin kit for a bulk oil dealership, including the warehouse that I added to the kit. Another feature I wanted to add was an unloading spot with a hose. I also wanted to have a suitably painted truck for local deliveries. 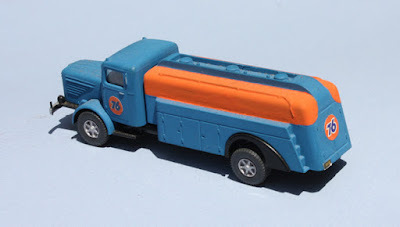 I chose a Wiking tank truck of suitable size, and then wondered about Union Oil paint schemes for such trucks. I was able to find a photo in one of the Union Oil company histories, and will say more about those books since it may suggest how modelers may learn about any oil company they choose to model. Union Oil contracted with authors Earl M. Welty and Frank J. Taylor to write a company history (originally titled The Black Bonanza), and it was published in 1950, then re-issued in revised editions in 1956 and 1958, all by McGraw-Hill. In 1966, the book was extensively revised and issued again as The 76 Bonanza by Lane Book Company, and still another time in 1976 as The Sign of the 76. Not every oil company has this kind of published material, but articles in business magazines, major newspapers, and of course today on the Internet, can all furnish valuable modeling information. 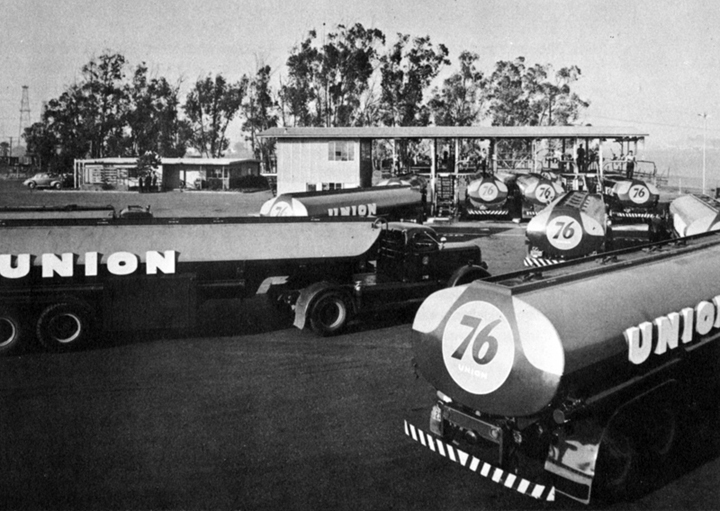 Getting back to that topic of truck paint schemes, here is an interesting photo of some Union trucks from the 1956 edition of The Black Bonanza. The semi-trailers seem all to have raised letters spelling out “UNION,” but the straight trucks, like my model, did not. Most visible trailers in the view above have dark blue bodies with orange along either side of the upper tank body, but there is at least one all-blue truck and at least one all-orange trailer visible in the photo (possibly those are earlier paint schemes). I was happy not to have to figure out how to do the raised letters. My Wiking truck looks like this, with a 1953 California truck license plate. Probably the blue should be darker. 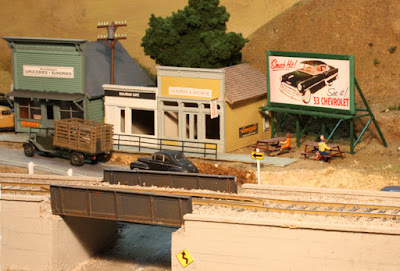 In the photo below, I show the completed dealership, with truck alongside, The road in the foreground is Bromela Road in my town of Ballard, with the brick warehouse of the Ballard Wine-Growers Cooperative in the left background, and some SP section houses in the right background. I plan to add a large round “76” sign on the Union warehouse wall just to the right of the truck. The Union Oil Company tank car in the foreground of the photo above conceals the unloading arrangement at this dealer. 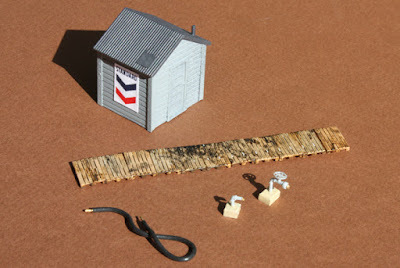 I modeled this unloading area with a length of duckboards, construction of which was described in a previous post (see it at: http://modelingthesp.blogspot.com/2015/08/duckboards.html ). I added an intake-pipe hose connection and two lengths of hose lying on the duckboards, made from No. 22 wire with black insulation. It’s shown below. You can click to enlarge. The tank car has been moved away from the unloading spot so you can see the arrangement. I might mention that this Union Oil model was included in the clinic I presented at the Portland NMRA national convention (August 2015), and the handout for that clinic is available as an earlier post in this blog (you can view it at: http://modelingthesp.blogspot.com/2015/08/handout-for-oil-dealership-clinic.html ). 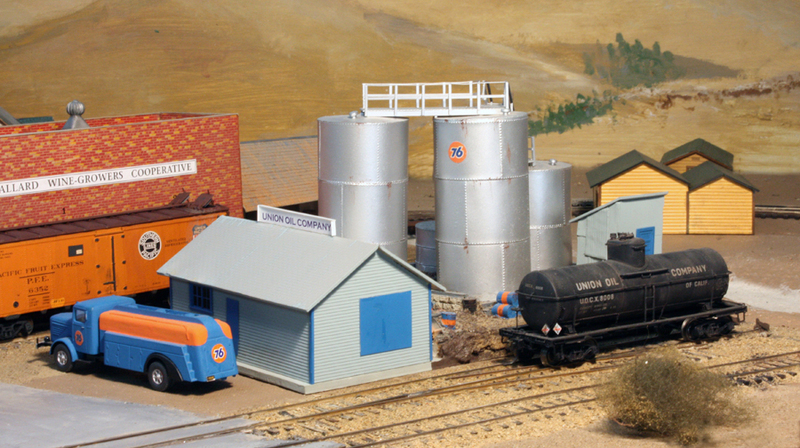 The Union Oil Company dealership shown in this post was first modeled some years ago when I built the basic Chooch kit and added the two vertical tanks at the back, and after awhile I added the warehouse also. That was the model on the layout until I was able to complete painting the delivery truck and add the unloading spot. It is now fully part of my operating sessions, usually receiving loads in Union Oil Company tank cars, but sometimes loads in leasing-company tank cars (GATX or SHPX) and occasionally gasoline in SP tank cars. All of those kinds of deliveries are known to be prototypical for Union Oil. 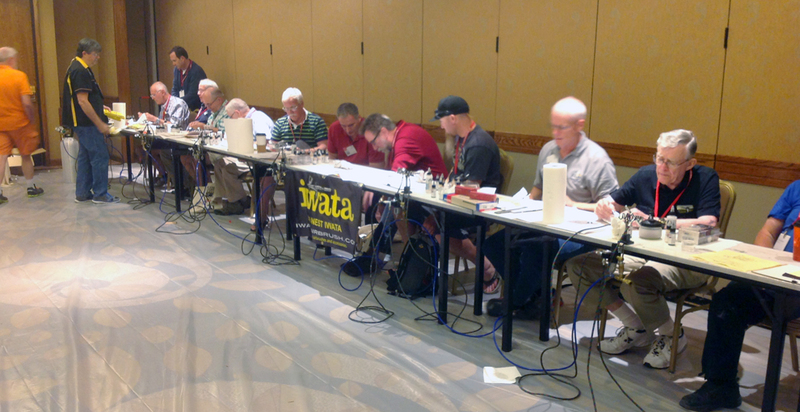 The 80th annual national convention of the National Model Railroad Association (NMRA) was held last week in Portland, Oregon. The host hotel was the DoubleTree at Lloyd Center, and it proved a very good venue for the talks and exhibit rooms. The Expo Center a few miles away was the site of the National Train Show on August 28–30. Though I was there all week, and took in many events, I can give only a tiny sample of all the activities in what I believe was an outstanding NMRA convention. Chairman Doug Auburg and his many staff did a great job. Among the essential features of any convention hotel is a good gathering place for people to meet and talk, and for some, a place to get the drink of their choice. 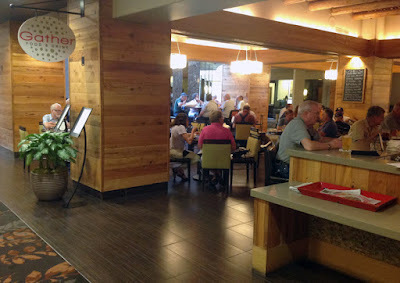 The bar just off the lobby at this DoubleTree was a very good example of this, and I confess to spending a certain amount of time here myself. One centerpiece for me at any such meeting is the clinic program, and this one was very full and largely very good. There were the usual nationally-known suspects giving talks, along with plenty of regional and even local speakers, making the program well rounded. There were few clinic times that I was not in a clinic room. I will just show a single photo, of Ed Merrin presenting his talk on the Northwestern Pacific, to illustrate this part of the convention. 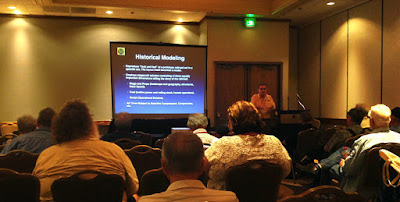 I gave two talks myself, each one twice, one on PFE operations, the other on Building a Realistic Bulk Oil Dealership (the handout for it is at this link: http://modelingthesp.blogspot.com/2015/08/handout-for-oil-dealership-clinic.html ). There was a very nice Railroad Prototype Modelers (RPM) room, though not displaying large numbers of models, doubtless due to minimal advance publicity. Tim Costello took on the burden of organizing and hosting this room, and one of the models on display which I especially liked was his depiction of a Milwaukee Road PS-1 box car later in its life, having been renumbered. He faded the Kadee manufacturer’s lettering with fine sandpaper, a very nice look. You can click to enlarge. Another nice exhibit at the RPM room was the classic approach in which the drawing that was the basis for the model is shown, along with a prototype photo, and the finished model. 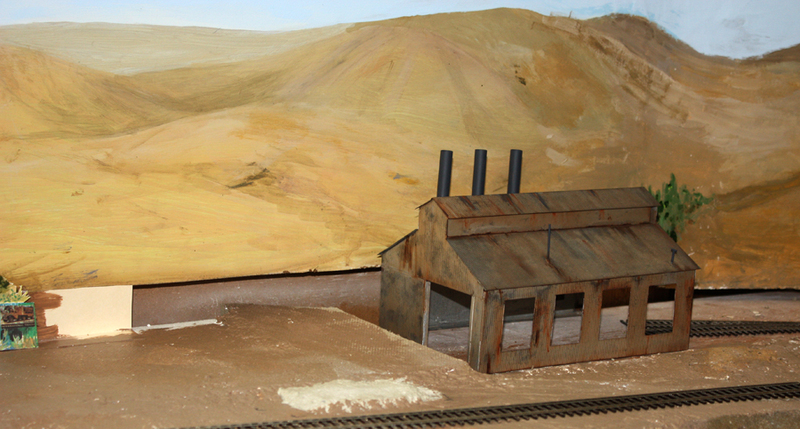 This is Kyle Gardiner’s Canadian Pacific sand house, very nice modeling. The usual NMRA contest room likewise did not have all that many models, but the quality level seemed very high to me. In recent years, Iwata-Medea has offered airbrushing clinics at many conventions, and this time I decided to attend. I have a pretty old airbrush, and thought I ought to try a hands-on experience with a well-made modern one. The clinics were presented by Alan Houtz (the morning one that I attended) and in the afternoon, by Tom Grossman, both very well done (I spectated a bit at Tom’s session). Here is a shot of the afternoon group. The hotel carpet was protected with plastic sheeting. Full disclosure: I liked the Iwata brush I used enough to buy one! Then the finale of the convention, the National Train Show, is always worthwhile, This year the number of vendors was not as big as some years, but the booths were still very interesting and well worth the time spent in visiting every one. 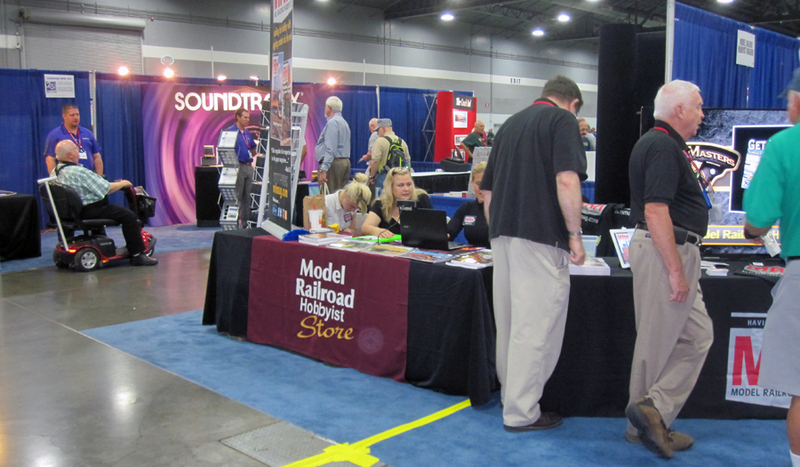 This shot shows the Model Railroad Hobbyist store. All in all, it was an outstanding convention, above average in my experience of NMRA national conventions. I really enjoyed it and was glad I could go.